Hello! Is it just me or is anyone getting slightly worried about summer? It is quite close on the horizon and I am fearful of another six weeks of me scrabbling round for stuff to do! THIS YEAR I AM GOING TO BE PREPARED! So whilst you read this I will mainly be researching 'free sh*t to do with kids in the Midlands this summer' whilst roping loads of people in to have playdates with us. 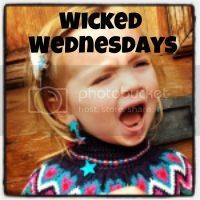 Thanks so much for all that linked up on Wicked Wednesday's last week! There were some cracking ones! My favourites from the week were a well placed bottle from Teen Tween Toddler, best baby hair ever from Heels and Hooves and a bog standard joyous trip to London from Chocolate and Wine and I'll Be Fine. Brilliant stuff. As per usual link up, comment lots and if you are popping it on instagram tag me in! If you just write my name I sometimes miss them as instagram seems to only show a few things at a time. Unless I am doing it wrong. Which could be the case as I am a moron. Enjoy your week babs! Now I'm a parent I know why Crazy Golf has its name! It's lovely for the first five minutes and the rest of it is about making it round with all your children alive by the end!! Feel your pain!